Forget the exit row — it’s inconvenient. Just pack less carry-on to maximise your legroom. In a career that spans three decades, comedian Julia Morris has travelled around the world and back again. 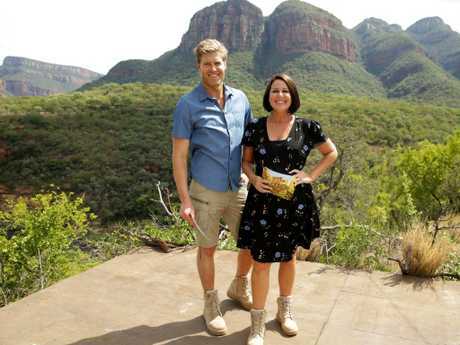 And whether she's heading into the African jungle for "I'm a Celebrity … Get Me Out of Here", embarking on a lengthy stand-up tour, or heading overseas on a family getaway with her hubby and two daughters, the TV star has a surefire method for packing her case. 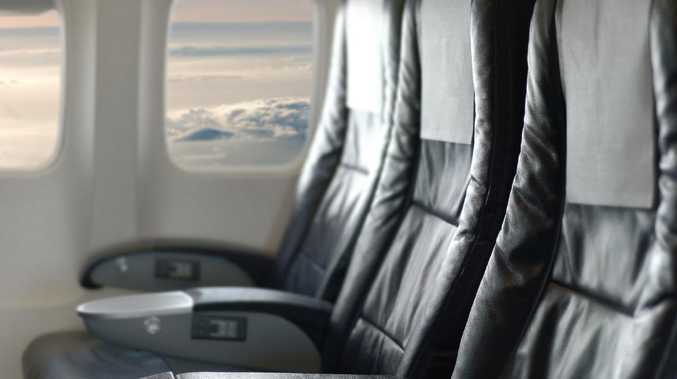 And if you think you know where the best seat on the plane is, think again. The ever popular front row is a no-go zone for Morris, who swears by only taking a handbag for carry-on to enable the best of both worlds: maximum legroom and ease of access. Less is more. I've found over the years I'd pack so much stuff into my carry on that all my stuff would be up around my neck. I'd have no room for my feet because there'd be so much rubbish! These days I really try to only take my handbag. That's why I also never sit in the front row of business or economy, because you always have to put your stuff up in the locker and I can't be bothered. Some people seem to think it means you're more important, but all I see is having to stand up repeatedly to get your bag out of the overhead locker. Lastly, be prepared with your carry-on - I like to follow the rules when I travel and to be prepared. Head down, bum up, and get there as smoothly as possible, is my motto. A pashmina as I hate being cold on board. If it's long haul then I take moisturiser and I've become THAT person who takes a facial mist. Hilarious. But there's definitely something that makes you feel nice and refreshed after using it. I like to keep what I take on-board as simple as possible. See above. 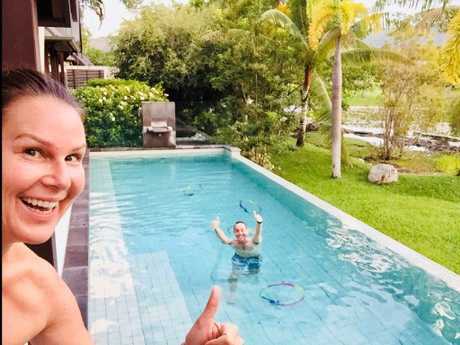 Julia Morris and her husband Dan Thomas on holiday in Port Douglas. Very organised. Packing is one of my happy places as it means I'm either going somewhere fun or I'm going home, both of which are delightful to me. I gather stuff I might want to take a week or so beforehand and then a few days out I'll start to cull. I'll add final stuff, such as toiletries, on the final day. Listing all of the days and activities for each and then putting together top to toe outfits accordingly. I also always make sure to leave room for retail because when I'm away I really like to shop. If I'm staying in a serviced apartment, then I might pack less as I can use the washing machine an dryer. Include trainers. I'm usually in heels when I'm on on stage or on TV, but my days of high heels are starting to become numbered. As soon as I've inside I put on my trainers, which I love and have in a selection of colours. If I'm on a stand-up tour everything is my responsibility, so I have to be very organised. I always make sure to pack my charger as I'm really starting to object to continually buying chargers after I've forgotten them. I have so many now! I also still take my hairdryer everywhere with me as, depending on where you're staying, often someone breathing on your hair will dry your hair quicker than the hotel hairdryer. High Sierra, because they give it to me for free! Every year I head out to the jungle for "I'm a Celebrity … Get Me Out of Here" I get one. So every year I keep adding one to my collection. I have them all in black but always make sure to add a piece of sequinned fabric around the top so I can easily spot them when they come out on the baggage carousel. Is chic and comfortable. I'm a big fan of a pant that looks like a trouser but acts like a tracksuit. Also, layers - layers are the key on an airplane. I always wear trainers too, cool Adidas are my preference. Toothbrush and toothpaste, moisturiser, and MAC Prep + Prime Fix - it's a spray that you put on before moisturiser. Roll! Rolling your clothes fits more in. Also, don't do doubles with outfits or "just in cases" as you can easily buy stuff when you get there. I put my toiletry bag into a plastic bag to avoid any leakage incidents and I love a hand held weight measure so I can make sure that check in is drama free. I don't want to have to unpack and switch stuff from bags with a queue of furious travellers behind me. Packing nail varnish without screwing the top back on properly - clothes ruined! Also, the shampoo I use - I won't name the brand - leaks every single time I've taken it. I've even considered dropping the company a line saying: 'Darl, get a better lid!' Now I individually zip-lock the bottle. My hair straighteners, but these days if I'm going on holiday I'm not that fussed. Julia Morris gearing up to host Blind Date on Channel 10. Unpacking the second I arrive. If I'm travelling for more than a few days then I take photos of my hubby, Dan, and the kids. I no longer take anything like scended candles - I used to think that it made difference, but I was kidding myself. Apart from that, I like to keep my room neat myself so I'll only let the cleaners into my room every fourth day or so. I'm 50 years old, I can make my own bed! To see if I can improve my packing. I definitely feel like I have it sorted, but I like to do a little bit of an inventory each time I come back from a trip to see what I didn't use so that I can slim down my luggage next time. If that's not a packing weirdo then I don't know what is! But when you're on the road as much as I am packing becomes your stock and trade. Blind Date, hosted by Julia Morris, premieres on Ten on Monday, October 15 at 7.30pm.